Yes, the images are from the morning after, but no alcohol induced elephant visions, only cardboard prints of the mascot for The Big Show. The Big Show has been around for some time. I remember the first show I went to hosted at Pierre’s former restaurant at Thai Van Lung street. Back in the old days. Work was pinned up on dividers set up in the restaurant and the creative community mingled. It has moved around to various venues. Sometimes indoors, sometimes outdoors, sometimes both. The Big Show has gotten bigger over the years. Recently Sun Flower Media, my former employer, have been improving the show in some aspects. 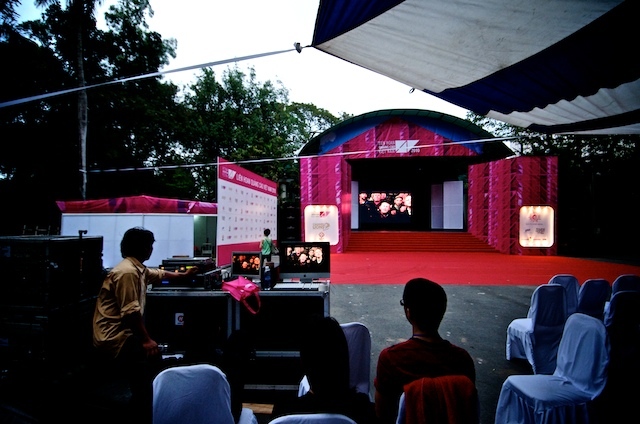 Last year, the show was located at the cinema and sports complex at Nguyen Du, district 1. This year it was at the Saigon Zoo. Fitting place for elephants, even purple ones. The opening evening draws the crowd and this year was no exception. I had not received any invite for the event, however, security staff handed out extras at the entrance, no worries, free for all. Great. We entered. 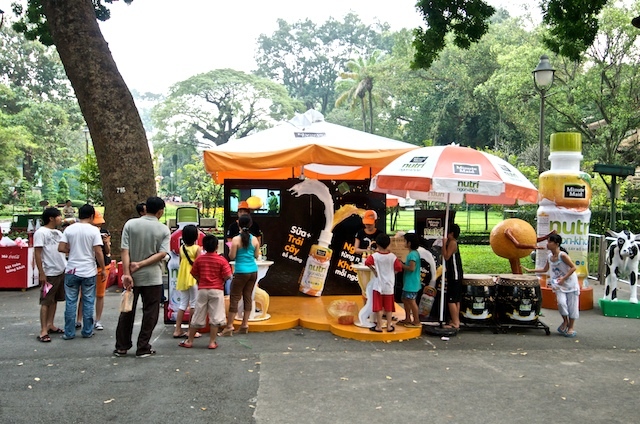 Sponsored booths at the entrance. More corporate sponsors had been brought in, samples handed out freely, including snack to eat and liquid to drink. Anyhow, the show must go on. For the first time, the works on display were actually unified in presentation style. All branded and printed out. It looked impressive compared to the previous events. To view the work you needed to do a bit of walking as they were all displayed on long rows. At the end you had the big screen. Most people did not sit down, they chose to stand at the back. Sometimes it makes sense to hang at the back as you can make small talk without getting your ears blasted by the normally loud volume. So far so good, or? What struck me was the feeling of fewer participants on display. They had a lot of work up. New work. International work. However, how many of the international campaigns make sense to the local audience if they do not know the culture that the campaign is targeting? I personally loved the ad for nose trimmers as they made used of the cable mayhem that you can see everyday in Vietnam. It is something that relates to here. What I am trying to say is that sometimes it is not about how much we improve the current product if the product has lost its relevance. According to Todd at Golden Digital (via David), it took only Vietnam 5 years to get up and going on the Internet. The young generation that is looking for inspiration, the very inspiration the Big Show used to provide, are finding that information easily online. They do not need to wait one year to see it on display. They have probably bookmarked it several months ago and shared it on Facebook or Twitter or by email to friends. Internet is changing our ways of working and making certain elements and business models obsolete. It is the nature of evolution. Improve or die. Improving the packaging does not mean that the product itself is improved. To me, personally, by attending an event such as the Big Show, it doesn’t give me much anymore. Except the possibility to actually bump into interesting people. To me, it is more an networking opportunity than an actual learning experience. It didn’t used to be like that. 10 years ago with slow internet access and few book stores, information was highly prized. These days you order on Amazon.com and get it shipped. Some bookstores even will do that for you and deliver to your door these days. 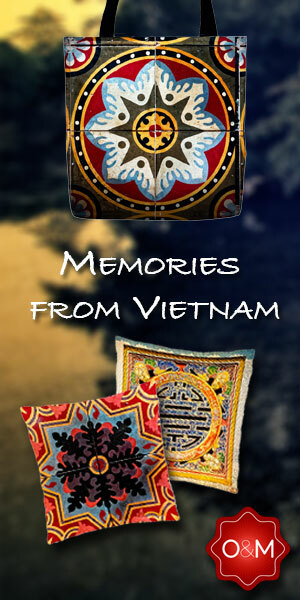 Internet has changed Vietnam and it is still changing rapidly. The recent BarCamp gathering is gaining serious traction and more IT companies are relocation to Vietnam. For a design student, yes, it is interesting to see work on display, however, what you need as a student is not the finished product but a peak at the process. How you got to that idea is far more interesting to know than seeing the final product. What sparks your imagination? What gets you inspired? These are the important questions. People in the creative industry are complaining how hard it is to find local creative talent and how they wish the local design education could improve. Well, to only see the final product, you feed the industry of copyist that will take what they see and, well, copy that. They will not understand the creative process. They will not be used to do research. They will not be used to do analysis. They will not innovate. By showing end results only, you will not create the opportunity to learn from the process. In the past, having access to international work was an inspiration as there was very difficult to access that information otherwise, however, technology has made that information so accessible that the need is no longer there. Next step on the evolution ladder is to understand more about the process and foster an environment that can be creative and innovative. We don’t need more technical jockeys, we need innovators. One of the remaining strengths of The Big Show is that it highlights the creative industry in the media, but how about extending the current scope and try to look at other ways to bring better value. To evolve and improve. Walking at the show the day after was sobering. Still a few visitors to the show. Lots of families with kids that did not come for the show but for their weekly family trip to the Zoo. 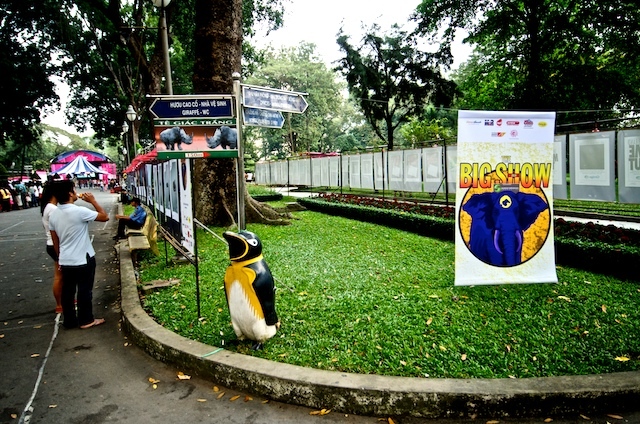 Saigon does not have many child friendly places and activities and the zoo is one of the most popular ones. The biggest crowd gatherer was not the work on display, but the artists drawing portraits for the public. The stage was empty. The screen showing re-runs of the reels. Staff sitting around waiting for the time to pass so they could wrap it all up. Imagine the effort put into creating the event. The marketing material produced, the advertising of the event, the building of the stage and different booths. All the staff to make it happen. For mainly a one night stand. The opening of the show. How about using the next day inviting the local agencies for short presentations? Make and publish a schedule. Get people to come and listen and see the work and hear about the process the day after. Get more out of the event than just an evening. BarCamp is successful for the presentations. People come to listen. To learn. There is a real interest here. Evolve and be part of the progress or wither as a dinosaur. The show will always go on. Critics of BarCamp are saying it is too long between the events. They want it more often. The same I say about The Big Show. Once a year is not enough in the current state. Daily I can access international campaigns as they are published online. What I want is interaction. Human interaction. As they say, find an itch and fix it. Best way to invent a new product or service. Well, Creative Mornings are about to see the light in Saigon. A monthly get together for creatives. Takes place in the mornings only. A healthy stimuli. Scheduled for launch in January. Stay tuned! Great story Mads, and I agree wholeheartedly. But will Stan and Rick and camp? Not if they don’t read the Internet – which considering the show had no digital section, I doubt. Here are a few links of last week’s shows and the upcoming CreativeMornings. Things will definitely get better! Thanks David. I recently met people from agencies that participated last year, but not this year. They did not even attend the opening show as they think it is not worthwhile their time. When people within the industry, the core believer group, are losing faith in the current model of The Big Show, I believe a review is long overdue. Hey guys, it’s so easy to talk. How about working a little bit? I love to see if YOU have ever contributed any of your time, let alone creativity and money to help grow the ad industry of Vietnam. Yes, the event was not yet perfect, but it was organized out of passion and good will. I hope one of you will offer help to make next year’s event better. I am sorry I sound rude, but I cannot stand big talkers! I know firsthand by working for you that you are passionate about what you do and your comment shows your passion and I don’t find it rude, just honest and direct and I appreciate that. That is one of the things that I do admire and respect you for. Bringing in Cannes Lion and Young Lions have helped the creative community and I know you brought them in out of your commitment to help grow the industry. I also know that you have committed to The Big Show. As I wrote above in the blog post, I have seen the show become more professional in appearance and the 2010 show was the most professional looking in that regard. However, you also taught me the importance of re-design on a regular basis, to not be stale. I also know that you appreciate an honest answer, you may not agree with it, but you expect people are being true when they comment just as you are. As I wrote, I have attended quite a few of the Big Show events and I noticed that especially this year, less local based agencies participated and some did not even come to the show. To me, that is worrisome. That prompted me to write the blog post. I am not the best writer, but I had to write something as this is something that we share a common passion for. I want, as much as you want, to have a thriving advertising industry. That was my intention with my post. To start a discussion. To see if any of the proposed ideas could gain any traction and prompt a re-design. Yes, you can count on me to help. I can help with what my strengths are, mainly creating concepts/ideas and photography. Please invite me and I will be there. I have never been a big talker and I do not intend to become one. Like you, I want to set time aside and do something for the community. I also want to share with you that we have started Saigon Creative Mornings. Our first event was last week and Dustin Nguyen was our speaker. We have lined up another speaker for next month’s event. I really hope you will feel a bit proud to see that we are following in your footstep by bringing in another creative element to Saigon. It is a small start, but we are putting our words into action. One thing you need to know is that any criticism the show have received here has been ‘constructive’ – meaning that if faults were pointed out, suggestions were also made as to how to fix them. #1) Bring back the ‘social’ aspect. In years past the Big Show was also a big party and fun! People talked and mingled. This year it was almost on the moon with a few elephants wandering around and no comfortable place for people to gather and talk. I missed that. 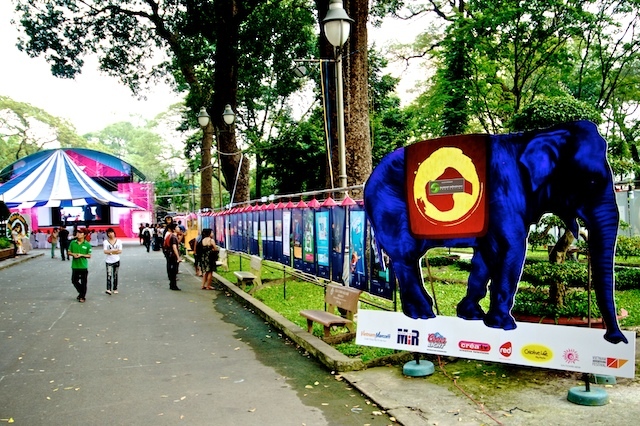 #2) Put the whole Vietnam Advertising Festival on the Internet. That’s where people go to learn and talk these days – Blogs, forums, etc. 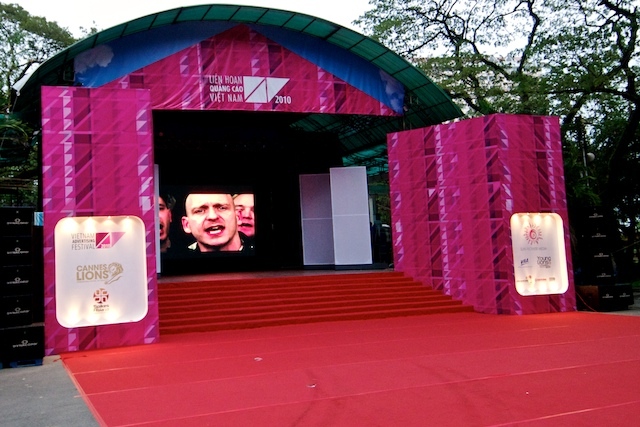 Currently the Vietnam Advertising Festival has no website – nor does the Young Lions and if I looked at the Big Show website and also the VAA website, I saw nothing to promote the Vietnam Advertising Festival. Welcome to Vietnam 3.0. Sunflower needs to get involved online! Did anyone go into the ‘New Media vs. Old Media’ room and see everyone pecking on an iPad and absolutely no one reading a magazine? Case closed. #3) Invite participation. Finally, after being constructively critical of some of the Young Lions work in 2010, I was asked by David Smail to be on the jury this year – but that’s the first I’ve ever heard from anyone. Good. I’ll do it. Happy to help. #4) Get people talking. Recently, an effort called Saigon/CreativeMornings has sought to get a ‘conversation’ going about creative and not just speakers standing up blabbing. http://Saigon/CreativeMornings.blogspot.com . They are also on LinkedIn with a discussion group and blog. Try bringing in this kind of interactivity to the VAF and the Big Show. It would be good.